Banking and financial services are some of the most saturated playing fields for recommendation and referral marketing. Nationwide’s high profile Share the Good Things campaign executed in cute TV ads, outdoor advertising, and social media is just the latest (and one of the slickest) iterations of this tried and tested formula for new customer acquisition which was first premiered on the UK High Street by Barclays back in 1996. There are examples of referral programmes running across almost all the main financial service players. Lloyds Bank Avios Credit Card shares 9000 avios points between the referrer and the friend they introduce. Funding Circle offers the chance to net £50 if a recommended friend or relative goes on to lend at least £1,000. For Zopa customers the £50 reward kicks in when the person they recommend lends £2,000 with the platform. One of our clients Nutmeg, the investment service, offers £100 account credit for every new customer introduced. They saw a great increase in recommendations by experimenting with the referral offer. TransferWise has made virality a key part of their proposition. 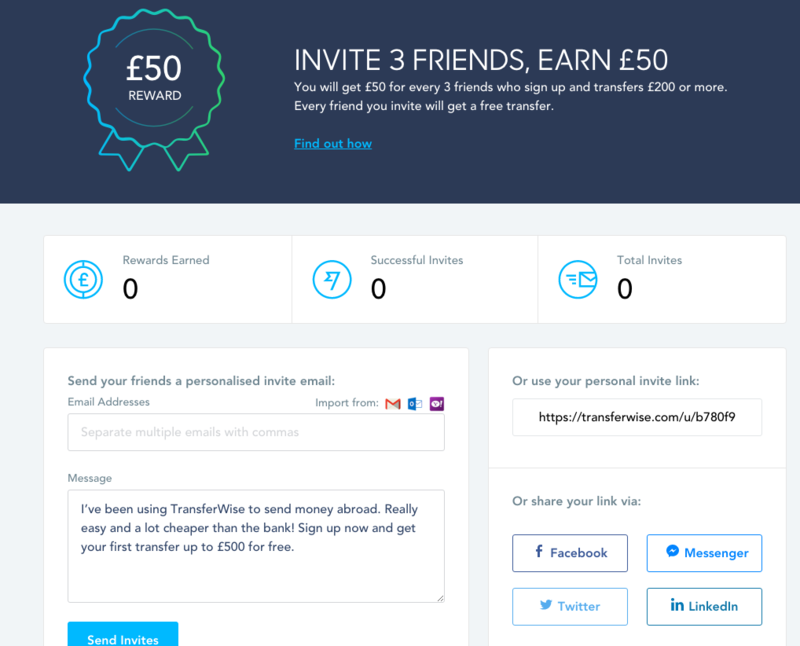 Every friend invited receives a discount on their first transfer and for every 3 invited friends who make a transfer over £200 the referrer wins £50. The list goes on: Wonga offers £20, for MoneyCorp its £25 and eToro offers up to $1000 for referring 10 friends. Even cash-back sites offer referral bonuses: Quidco offers a £2.50 cashback bonus when one of their members recommends the site and a friend goes on to use it. 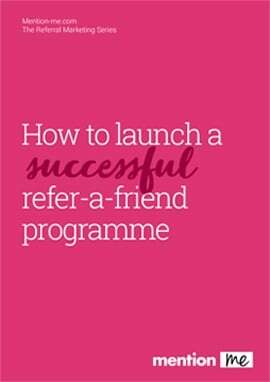 In such a crowded landscape, just having a refer-a-friend programme is not enough to stand out from your peers like it was for Barclays back in the days of the Spice Girls. So what pitfalls can we identify, and equally what best practices can we apply to make referral a differentiator for financial services again? Disclosure - although we manage over 100 refer-a-friend schemes here at Mention Me we don’t power referral for any of the brands listed in this blog, this is our totally impartial take on the financial sector. Hurray for free advice! Most of the examples we looked at reward a referral with cash. In research we’ve done for other sectors like retail, cash was definitely one of the most preferred incentives. However, the problem here is that they are all basically the same reward type and the same value. There is no differentiation value for the consumer. Best practice: It’s tough to find evidence of any financial services provider breaking the mould. Credit card companies are dancing to their own tune with loyalty points as an incentive but as they all seem to have piled on to that bandwagon the differentiation bonus has dissipated. The next level: Financial service providers could be brave and step away from cash; testing some more innovative reward types. This is tricky with an internally built referral platform which is probably hard coded to offer only one incentive. With an outsourced provider that supports reward-level AB testing by cohort experimenting with different rewards at the same time becomes very simple. If cash really does prove to be the most effective at generating new business then the next level of experiments could be around the rules for being paid out. We’ve run some simple experiments like this for some of our refer-a-friend clients and the impact of relaxing constraints can sometimes treble the number of people willing to share an offer. As a general rule consumers find it psychologically easier to recommend brands and services which they think are new or novel or when the brand has a strong story to tell. The challenger fintech brands like TransferWise and Nutmeg have plenty of novelty but many traditional financial brands lack that driver of social capital and probably have a low rate of sharing as a result. In this case a higher referral incentive can be one way to encourage more sharing. Best practice: Nationwide has done a great job of not only giving their recommend a friend campaign a strong story (and it’s own URL!) but also fully backing it with a very high-value incentive (£100). The next level: The problem with simply increasing the amount of cash to get cut-through is that it can end up in an escalating incentives ‘war’, with each brand racing to match and better the incentives on offer at their competition. A smarter approach would be to play with the value and type of incentives; offering differentiated incentives in bursts (effectively creating mini-campaigns within a longer-running referral programme) or offering different incentives to different customer segments. A high net worth customer is hardly likely to refer for £100; but might for access to VIP rewards like exclusive hospitality events. More creative and emotional messaging should also lift the ho-hum executions on the brands we reviewed. Many refer-a-friend landing pages are treated in a semi-technical way - as if they have not been treated like a genuine marketing campaign (more like an afterthought). Financial businesses could do with lavishing a little love on their copy: testing some of the social capital concepts we’ve explored in our Psychology of Referral Series. Across Mention Me clients the percentage of customers who share a referral offer at checkout varies dramatically from 2% to as high as 70% with many brands hovering around 20%. I’d bet that even with their TV campaign Nationwide is not succeeding in getting 20% of their customers to share. Why? There are probably a few reasons why financial services sharing is unlikely to penetrate a significant percentage of their customer base: the forms required to introduce a friend are often long and the rules for being paid out can be hard to understand. These are both barriers which can cause referrers to give up on sharing because the perceived effort is too high and the likelihood of being rewarded is too low. Best practice: Transferwise has done a wonderful job making it easy to share with their neat referral dashboard (below). This makes use of many of the best practices for referral from the wider internet: a personal sharing link, social media sharing and tracking of how many friends have successfully joined the service. The next level: Take a look at the innovation going on in retail refer-a-friend and copy it, like Transferwise have done. Most outsourced referral platforms now offer customised dashboards like this as a standard part of their service. Here is an example of one which we’ve created recently for a Mention Me client. The best time to ask someone to share your brand is immediately after their point of greatest delight. In our research we find it works best if they are already interacting with you and you ask them to break off what they’re doing for a moment to refer. Asking later, by email or via links from landing pages or your homepage never seems to yield as much engagement or conversion. For retailers this point is generally right after completing an order and businesses with high purchase frequency benefit from exposing their customers to the sharing options time and time again. This can be a little difficult for some types of financial service where usage is infrequent. The answer could be asking for many referrals up front and letting customers know that if they refer more than once they will get ever-higher rewards. This should encourage multiple referrals even if the visits to the referral dashboard are few and far between. Best practice. This technique is used nicely by eToro, who make their reward seem more exciting and motivating by allowing it to accumulate for up to 10 new friends who join. eToro can therefore use messaging like: earn up to $1000. The next level: Offering rewards that accumulate is definitely a good idea. You could do this in a simple step-wise fashion (e.g. £50 for each new sign-up) or experiment with different reward increments (e.g. £30 for the first and £50 for the second friend). With visibility of your customer data you can plan your incentives to drive the next referral where you need it most. For example if your data shows that most customers refer only one friend then offering a 10x messaging might not be as motivating as increasing the incentive for the second referral. Finally, while stacking incentives is a good way to get multiple shares when interaction with the refer-a-friend programme is infrequent, it should also pay to integrate the programme widely at the points in the customer journey where users are likely to use it. In the mobile app or in an overlay at logout would work well to increase engagement. And there you have it… free advice (remember Mention Me doesn't run any of these programmes) for those looking after referral for financial services businesses and a cheeky Spice Girls reference to boot. Zigazig-ah.